Author of "Noni Juice The Tropical Fruit with 101 Medicinal Uses"
Morinda Citrifolia (Noni Fruit) Noni Juice History and Use! Since 1997 I have researched the scientific evidence and field studies involving the island fruit Noni to uncover its secrets as a medicinal agent. I logged many hours digging through case studies and reports from doctors and other experts, and analyzed reports from an array of clinical trials. I also interviewed more than 50 doctors and other health professionals who had compiled data that collectively represented over 10,000 people who had used or were using Noni.As I was collecting these data, one of the questions that I continually came back to was: "How can Noni possibly help so many people with so many diverse health problems? What was its secret?" I concluded that, indeed, it does not help everyone -- and it does not help with all health problems. However, on an average, 78 percent of the more than 10,000 Noni users in our survey reported that it helped in some way, including fighting cancer, heart disease, digestive disorders, diabetes, autoimmune disorders, stroke, weight problems, and skin and hair problems. This booklet provides an overview of my findings. Acts as anti-inflammatory and anti-histaminic agent. Has antibacterial properties that can protect against digestive and heart damage. Works with melatonin and serotonin to help regulate sleep, temperature and mood cycles. Inhibits pre-cancer function and growth of cancer tumors. The following table contains statistical analysis of the data, including both primary and secondary applications, that I obtained from surveying more than 50 doctors and other health professionals who had taken Noni and/or given it to over 10,000 patients. It depicts the number of people who drank Noni Juice for 23 different conditions, the percentage that were helped, and the primary active components (PAC) believed to be involved. It is my belief that although the PAC is the major component, it is the total blend of all natural ingredients that result in Noniâ€™s optimal health benefits. *Pooled percentage of people who experienced objective and/or subjective improvement of their signs and/or symptoms after taking noni. The majority of noni users who did not get optimal results failed to do so because they took a lesser dose and/or took it a lesser amount of time than recommended in the table below. Noni can be taken together with all other medications - there are almost no negative interactions. In some situations, Noni can allow other medications to act more efficiently. You should tell your health professional that you are taking Noni, as your physician might want to decrease the dose of the medication prescribed. This often reduces the side effects from the original medication.Reported side effects were minimal. Less than 5 percent experienced minor belching, loose stools, allergy, or developed a mild rash. The belching disappeared when the dose was decreased. The rash and loose stools cleared within 72 hours after stopping treatment. 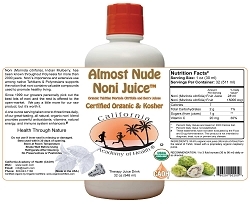 Noni has been reported safe for pregnant and/or nursing mothers. Noni works synergistically with other food supplements and/or medications. 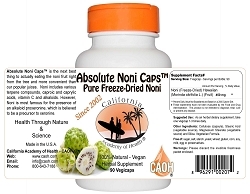 Noni probably helps with prevention, and works optimally in conjunction with other antioxidants. Noni helps animals heal faster. 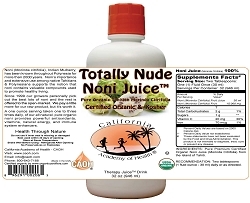 Noni stimulates the production of T-cells in the immune system. T-cells play a pivotal role in fighting disease. Noni acts to enhance the immune system involving macrophages and/or lymphocytes, which are a vital part of your body's natural defenses. Noni has been shown to combat many types of bacteria. Noni has unique anti-pain effects. Noni inhibits pre-cancer function and the growth of cancer tumors by allowing abnormal cells to function more normally. Dr. Schechter states, "As a clinical therapist, I have seen Noni generate significant, even profound, therapeutic benefits for both prevention and self-help of a wide range of health problems. "From Dr. Schechter's list and from the information provided by the other professionals with whom I communicated, I have determined the primary application categories, which are discussed in the following overview. Though there are many other valuable uses of Noni, as the charts show, only those with the most support have been included. Reference: This material was taken from the book "The Noni Phenomenon" by Dr. Neil Solomon, M.D., Ph.D.